This journal focuses on the cultural aspects of contemporary sociology, and creates a common forum for scholars, practitioners, and researchers worldwide to follow the latest developments and debates within the field. Since the early days of modernity many social theorists have anticipated the downfall of meaning induced by the emerging and predominant forces of rationalization and industrialization. However, in spite of it all, cultural structures and processes withstood those strong influences and developed autonomous patterns of meaning that affect many structures such as inequality, racism and marginality, gender and sexuality, crime and punishment, social movements, market success and citizen incorporation. The new discipline of cultural sociology was born in this vast mélange of phenomena with the aim to conceptualize these complex cultural processes. 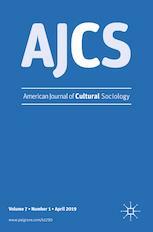 By bringing together the many debates around these field-specific theoretical and methodological questions, the journal underlines the cultural turn in contemporary sociology. Conceived as open space for discussion, it engages in a meaning-centered social inquiry aiming for a facilitated communication, sharpened contrast and a synthesis of different perspectives. Research chosen for publication reflects meaning-centered sociology and welcomes various approaches such as contemporary and historical studies, macro and micro perspectives, institutional and symbolic work, ethnographic and statistical techniques and philosophical and methodological ways.